The well renowned 3 Course Thai Cooking Class offered by fuAsian ties together some of the most popular Thai dishes into one class. You will learn how to prepare and roll your own salad rolls. Learn to differentiate a restaurant style Tom Kha Soup and that made from scratch using fresh spices. 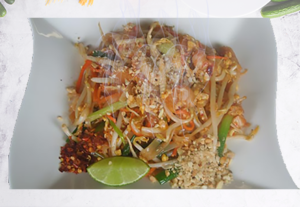 Then you will learn the technique how to whip up Pad Thai in a cast iron wok using fuAsian’s Pad Thai Sauce. You will be served a desert to complete the meal. Like all the other classes we offer, the class is hands on and we get to eat what we make!